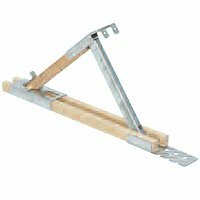 This user-friendly, 90 degree angle Roof Bracket is 16-inches long and designed for use with a sound 2x6 plank. It features four offset nail slots (OSHA requires three) that will not allow the bracket to slide up, six long welds for strength, a back stiffening rib to eliminate twists and flexing, smooth edges and rounded corners that will not cut hands or work area, and a welded gusset to endure wear and tear. It is easy to set up, operate, reposition and remove without causing damage to shingles. Easy to see in safety yellow. Other angles and sizes are available. 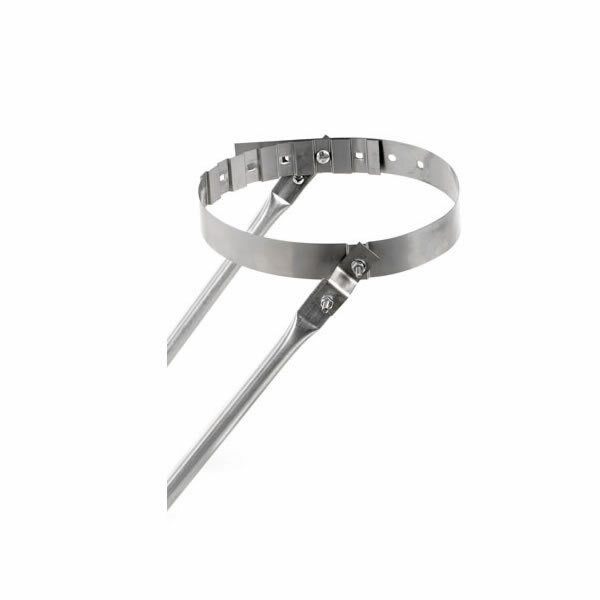 This heavy-duty roof bracket adjusts and locks in six positions and accommodates roof pitches from 3/12 to 10/12. Made of galvanized steel for extra strength, safety, and durability, it is easy to set up, operate, reposition and remove without damaging shingles, and it folds flat for compact storage and transport. Complies with OSHA regulations. The unique 12070 is the ideal roofing guardrail system. 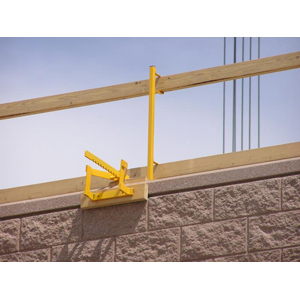 This roof bracket comes with a guardrail post holder and the post to hold two 2x4's. The 2x4's, when inserted through the post slots and used in conjunction with a 2x6 toeboard, form a safe, continuous guardrail around the roof edge for shingle removal or installation. 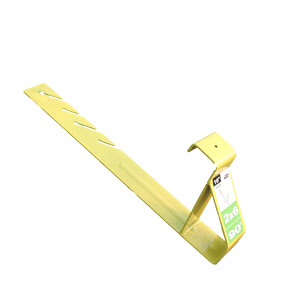 This setup complies with new OSHA standards for fall protection, is easy to install and remove, adjusts to accommodate roof pitches from 6/12 to 16/12, is lightweight and compact for storage, and is yellow in color for safety. This user-friendly, heavy-duty 60 degree angle Roof Bracket is 19-inches long and designed for use with a sound 2x6 plank. It features four offset nail slots (OSHA requires three) that will not allow the bracket to slide up, six long welds for strength, a back stiffening rib to eliminate twists and flexing, smooth edges and rounded corners that will not cut hands or work area, and a welded gusset to endure wear and tear. It is easy to set up, operate, reposition and remove without causing damage to shingles. Easy to see in safety yellow. Other angles and sizes are available. With this simple and safe parapet wall guardrail system, workmen do not have to work on the outside of a parapet wall to attach brackets or guardrail posts. This roof bracket comes with a guardrail post holder and the post to hold two 2x4's. The 2x4's, when inserted through the post slots and used in conjunction with a 2x6 toeboard, form a safe, continuous guardrail around the roof edge. It is compliant with OSHA regulations for fall protection, and since the post is always on the inner side of the parapet wall, it meets OSHA's height regulations throughout its use. It is lightweight and easily installed by one person without ladders or scaffolds, and individual units can be moved without complete disassembly of the system. It is the only system in the industry that can adjust to accommodate 4 to 24inch walls with a 3inch adjustment screw. 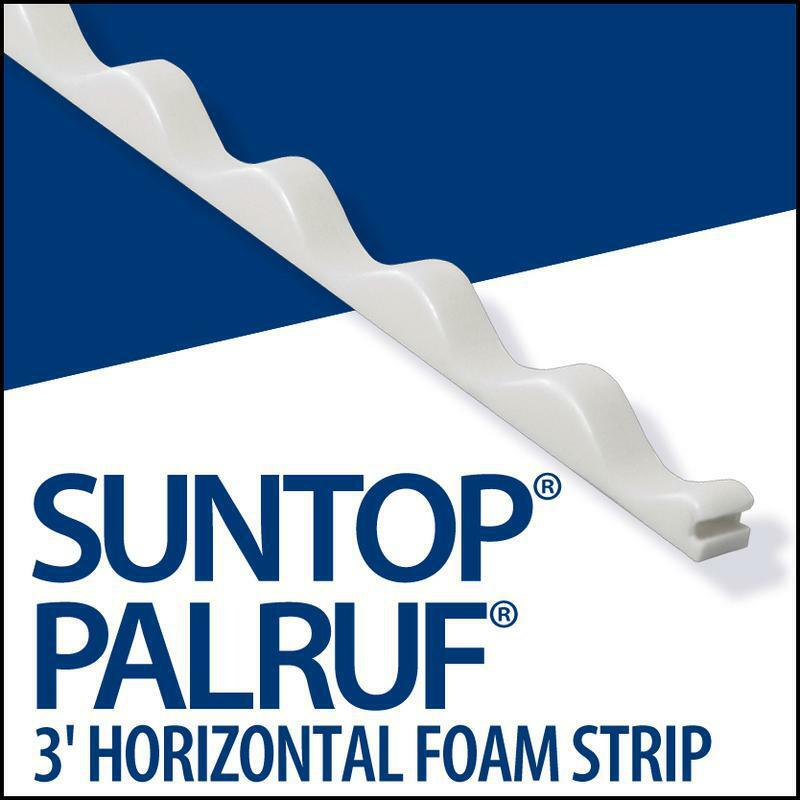 These user-friendly, heavy-duty 90 degree angle roof brackets are 19 inches long and are designed for use with a sound 2x6 plank. They feature four offset nail slots (OSHA requires three) that will not allow the bracket to slide up, six long welds for strength, a back stiffening rib to eliminate twists and flexing, smooth edges and rounded corners that will not cut hands or work area, and a welded gusset to endure wear and tear. They are easy to set up, operate, reposition and remove without causing damage to shingles, and they are easy to see in safety yellow. Other angles and sizes are available. 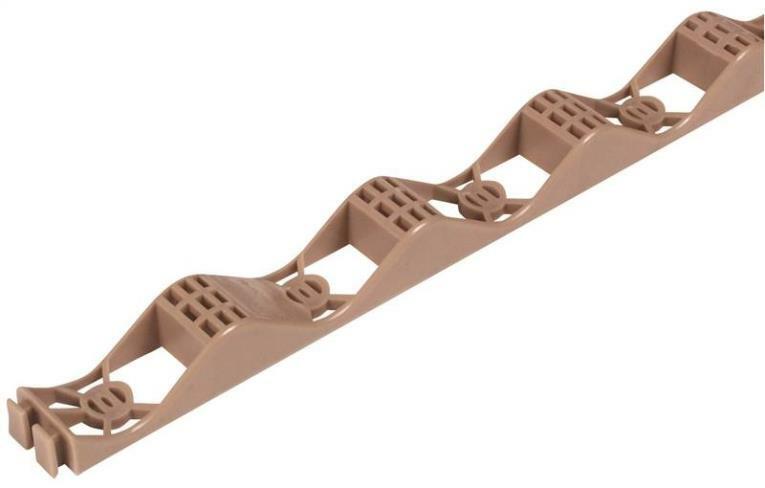 This user-friendly, 60 degree angle Roof Bracket is 16-inches long and designed for use with a sound 2x6 plank. It features four offset nail slots (OSHA requires three) that will not allow the bracket to slide up, six long welds for strength, a back stiffening rib to eliminate twists and flexing, smooth edges and rounded corners that will not cut hands or work area, and a welded gusset to endure wear and tear. It is easy to set up, operate, reposition and remove without causing damage to shingles. Easy to see in safety yellow. Other angles and sizes are available. This user-friendly, heavy-duty 45 degree angle Roof Bracket is 19-inches long and designed for use with a sound 2x8 plank. It features four offset nail slots (OSHA requires three) that will not allow the bracket to slide up, six long welds for strength, a back stiffening rib to eliminate twists and flexing, smooth edges and rounded corners that will not cut hands or work area, and a welded gusset to endure wear and tear. It is easy to set up, operate, reposition and remove without causing damage to shingles. Easy to see in safety yellow. Other angles and sizes are available. 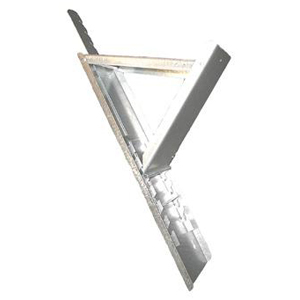 This user-friendly, 90 degree angle Roof Brackets is 16-inches long and designed for use with a sound 2x4 plank. It features four offset nail slots (OSHA requires three) that will not allow the bracket to slide up, six long welds for strength, a back stiffening rib to eliminate twists and flexing, smooth edges and rounded corners that will not cut hands or work area, and a welded gusset to endure wear and tear. It is easy to set up, operate, reposition and remove without causing damage to shingles. Easy to see in safety yellow. Other angles and sizes are available. These user-friendly, heavy-duty 60 degree angle roof brackets are 19 inches long and are designed for use with a sound 2x8 plank. 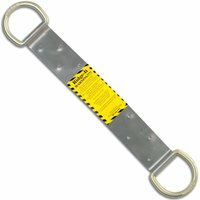 They feature four offset nail slots (OSHA requires three) that will not allow the bracket to slide up. 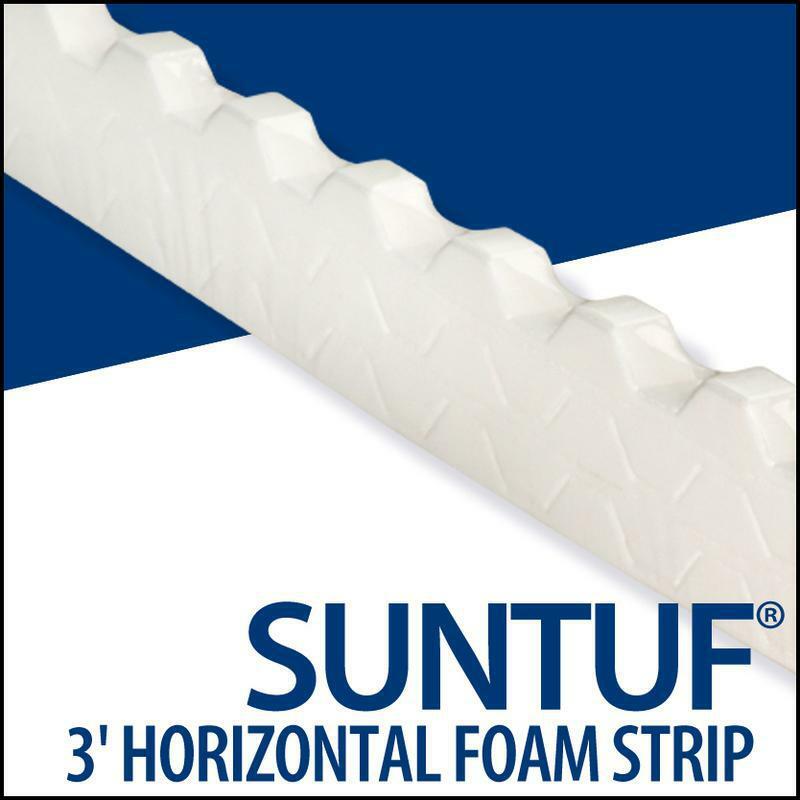 Includes 6 long welds for strength, a back stiffening rib to eliminate twists and flexing, smooth edges and rounded corners that will not cut hands or work area, and a welded gusset to endure wear and tear. They are easy to set up, operate, reposition and remove without causing damage to shingles, and they are easy to see in safety yellow. Other angles and sizes are available. 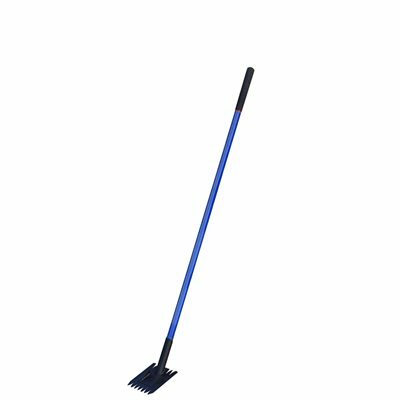 ROOFING RIPPER 7" x 7" powder coated ripping blade with teeth on both sides 11/4" diameter x 43" long fiberglass handle with grip Overall height is 55"
This user-friendly, 45 degree angle Roof Bracket is 16-inches long and designed for use with a sound 2x6 plank. It features four offset nail slots (OSHA requires three) that will not allow the bracket to slide up, six long welds for strength, a back stiffening rib to eliminate twists and flexing, smooth edges and rounded corners that will not cut hands or work area, and a welded gusset to endure wear and tear. It is easy to set up, operate, reposition and remove without causing damage to shingles. Easy to see in safety yellow. Other angles and sizes are available. 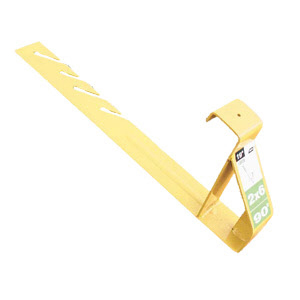 This user-friendly, heavy-duty 60 degree angle Roof Bracket is 19-inches long and designed for use with a sound 2x10 plank. It features four offset nail slots (OSHA requires three) that will not allow the bracket to slide up, six long welds for strength, a back stiffening rib to eliminate twists and flexing, smooth edges and rounded corners that will not cut hands or work area, and a welded gusset to endure wear and tear. It is easy to set up, operate, reposition and remove without causing damage to shingles. Easy to see in safety yellow. Other angles and sizes are available. 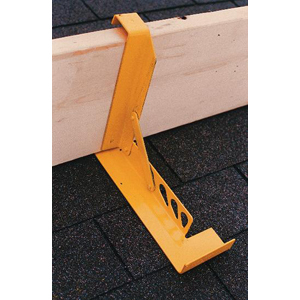 This user-friendly, heavy-duty 45 degree angle Roof Bracket is 19-inches long and designed for use with a sound 2x10 plank. It features four offset nail slots (OSHA requires three) that will not allow the bracket to slide up, six long welds for strength, a back stiffening rib to eliminate twists and flexing, smooth edges and rounded corners that will not cut hands or work area, and a welded gusset to endure wear and tear. It is easy to set up, operate, reposition and remove without causing damage to shingles. Easy to see in safety yellow. Other angles and sizes are available. This user-friendly, heavy-duty 45 degree angle Roof Bracket is 19-inches long and designed for use with a sound 2x6 plank. It features four offset nail slots (OSHA requires three) that will not allow the bracket to slide up, six long welds for strength, a back stiffening rib to eliminate twists and flexing, smooth edges and rounded corners that will not cut hands or work area, and a welded gusset to endure wear and tear. It is easy to set up, operate, reposition and remove without causing damage to shingles. Easy to see in safety yellow. Other angles and sizes are available. These user-friendly, heavy-duty 90 degree angle roof brackets are 19 inches long and are designed for use with a sound 2x10 plank. They feature four offset nail slots (OSHA requires three) that will not allow the bracket to slide up, six long welds for strength, a back stiffening rib to eliminate twists and flexing, smooth edges and rounded corners that will not cut hands or work area, and a welded gusset to endure wear and tear. They are easy to set up, operate, reposition and remove without causing damage to shingles, and they are easy to see in safety yellow. Other angles and sizes are available. These user-friendly, heavy-duty 90 degree angle roof brackets are 19 inches long and are designed for use with a sound 2x4 plank. They feature four offset nail slots (OSHA requires three) that will not allow the bracket to slide up, six long welds for strength, a back stiffening rib to eliminate twists and flexing, smooth edges and rounded corners that will not cut hands or work area, and a welded gusset to endure wear and tear. They are easy to set up, operate, reposition and remove without causing damage to shingles, and they are easy to see in safety yellow. Other angles and sizes are available. These user-friendly, heavy-duty 90 degree angle roof brackets are 19 inches long and are designed for use with a sound 2x8 plank. They feature four offset nail slots (OSHA requires three) that will not allow the bracket to slide up, six long welds for strength, a back stiffening rib to eliminate twists and flexing, smooth edges and rounded corners that will not cut hands or work area, and a welded gusset to endure wear and tear. They are easy to set up, operate, reposition and remove without causing damage to shingles, and they are easy to see in safety yellow. Other angles and sizes are available.